Latin America is a vast region that spans twenty-one countries and almost the entirety of the western hemisphere. Unfortunately, most people are largely unaware of the breadth, diversity, and healthful qualities of many Latin foods. Educating the public about the cuisines of Latin America lies at the heart of the CFA’s work. Our experts travel throughout Latin America capturing, documenting, and cataloging the ingredients, iconic dishes, regional cuisines, and street foods that define the foodways of Latin America. They also chronicle the evolution and reinterpretation of these traditional foods. Whether it’s the artisanal moles of Oaxaca, the flavor profiles of Peruvian ceviches, or the techniques used for making the rich Brazilian seafood stews of Bahia, preserving these traditions is essential as they provide important perspectives on culture and society. There's a lot going on at the CFA, including an annual symposium that focuses on the world heritage of Latin cuisine. A series of ongoing classes cover Peruvian cuisine; Classic Cuisines of Mexico from Puebla and Oaxaca; and Classic Cuisines of Mexico from Major Regions (regions include Puebla, Oaxaca, Guerrero, Veracruz, Tlaxcala, and Morelos). In these classes you prepare important traditional dishes and learn about the particular cuisine's history. And CFA's website is a goldmine of Latin American culinary info, recipes, videos and more. I found the discussion of the complexity of Mexican cuisine--starting with its pre-Columbian roots--to be fascinating. And I was delighted to find this collection of Brazilian recipes available free for download as a PDF. Nice photos, and crystal-clear recipes for such famous specialties as the iconic Brazilian Feijoada and Acarajé (bean fritters), and goodies that are lesser known to Americans such as Pasteis de Bacalao (salted codfish savories), Vinagrete de Lula (marinated squid salad), or Pao de Queijo (tapioca cheese rolls). 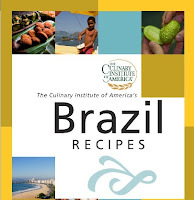 So go ahead and download the Culinary Institute of America's booklet, Brazil Recipes. Diet Tips for 2010 from...Hershey?